I love art and history. What better way to have both go hand in hand with Antique Automobiles. Everyone has their own story that goes with that old truck that belonged to grandpa or the memories that went along with a 57 Chevy cruising main street on Saturday nights. 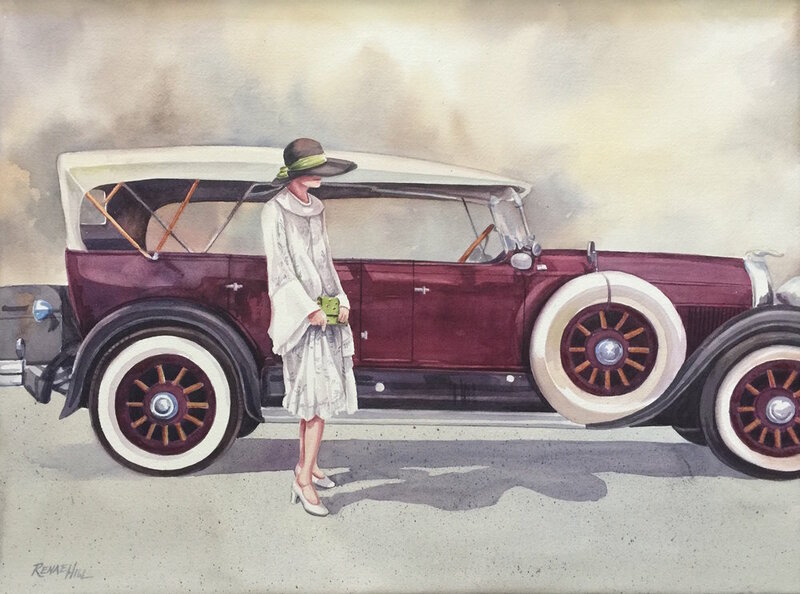 The styles they wore back in the roaring 20s accent the classic autos back in the day. You can hold on to the good old days through these beautifully preserved autos. The character and attention to detail is a joy for me to paint. I just attended the Rotary Antique Car Show in San Clemente, California a few weeks ago. The heart and soul that are put into preserving these cars are so impressive. I get all kinds of inspiration and take lots of pictures for the next painting of an auto I'll be doing. 69 Corvette and Winslow, Arizona. Let's create something custom for you! Do you have a loved one or yourself that owns one of these beauty’s? With your photos can create a costom painting of your beloved classic auto. I can add very personal touches like an interesting background or a loved one near or in the car. Or even your dog if you like.